Royal Caribbean will cease home porting its ships in Malaga, Spain in 2013. Currently Adventure of the Seas is there and will complete its 28 cruises but by 2013, she will move to be ported out of Southampton, England. The move by Royal Caribbean to leave Malaga isn't permanent. Royal Caribbean describes the change as "transitional" and anticipates reassessing the possibility of returning to Malaga in 2014, "given the interest of the company for the city". Royal Caribbean has spent three years operating out of Malaga, near Valencia, as a base port for the western Mediterranean. The Adventure of the Seas, with capacity for 3,840 passengers, currently covers the route Málaga, Valencia, Civitavecchia (Rome), Livorno (Pisa and Florence) and Ajaccio (Corsica). The change was characterized by a Royal Caribbean spokeswoman as "reprogramming of the ships to meet new demand" and she also indicated that Malaga has received very high results in passenger satisfaction surveys. 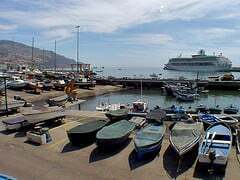 Sebastian Camps, the Malaga port manager, insists Royal Caribbean's departure is "temporary" and blames the economic situation in the Mediterranena area.